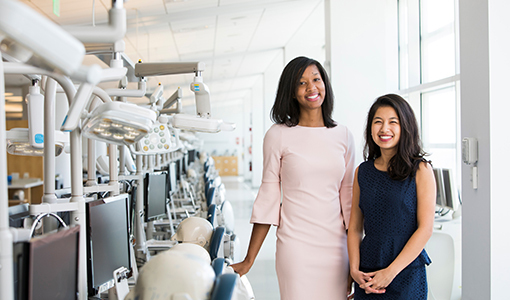 Tabitha Lewis and Anne-Marie Vu both hope to pursue careers in pediatric dentistry, but they’re not waiting until after graduation to help children. During the past academic year, the two completed Schweitzer Fellowship projects that brought oral-health education—along with a dose of fun and mentoring—to some of Boston’s most vulnerable children. Lewis, D19, worked at a Roxbury homeless shelter; Vu, A15, D19, worked at a Dorchester elementary school with students who have autism spectrum disorder. The children weren’t the only ones who benefited. “This was a great way to allocate my time,” said Vu, who is involved with the Tufts student chapter of the American Academy of Developmental Medicine and Dentistry. 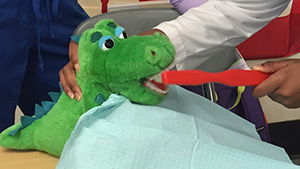 “I’ve always liked teaching and working with kids.” Her project, “Miles of Smiles,” involved games to normalize the experience of going to the dentist and quell any of their fears. One activity, for example, involved brushing cola stains off hard-boiled eggs. Albert Schweitzer Fellowships offer graduate students the opportunity to design and carry out a one-year community service project, usually connected to chronic-health issues or health disparities. 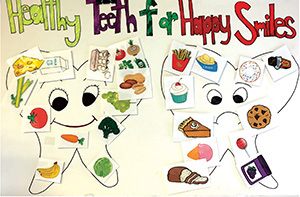 Previous Schweitzer fellows chosen from the dental school have developed an oral-health video game for middle schoolers, started a mentoring program for dental assistant students at a Boston vocational school, and offered oral-health education to parents of preschoolers at a Head Start program in Chinatown. “When I applied to Albert Schweitzer, I told them I wanted to increase the self-efficacy of young children, and use art and music sessions centered around oral health as a vehicle to do that,” said Lewis, who also has an undergraduate degree in elementary education. She ended up working with a group of children who were mostly ten- and eleven-years old, and struck on the idea of using song titles from an album by Chance the Rapper, Coloring Book, as a framework for the project (which she called “Coloring Smiles”). For instance, the name of one song, “All We Got,” was used to reinforce the idea that “all we got are these teeth”—you need to take care of the teeth you have.